The regal tang (Paracanthurus hepatus) found new popularity thanks to the character of "Dori" in the film Finding Nemo. Also known as the blue tang or blue hippo tang, these fish have gorgeous yellow, blue and black markings. While hardier than other members of the tang/surgeonfish family, they still require the skills of an advanced marine aquarium hobbyist to thrive in the home aquarium. In the wild, regal tangs have a tropical, Indo-Pacific distribution. These surgeonfish typically live among cauliflower corals (Pocillopora) on the seaward side of coral reefs. To resist strong currents, regal tangs have developed a tendency to lay down on their side when stressed, a behavior that can alarm a aquarium hobbyist who just purchased these expensive fish. This apparent "fainting" serves the fish in the wild and does not mean anything in captivity. Regal tangs have an omnivorous diet, with an emphasis on algae. On the reef, they browse for algae throughout the day. They also eat small invertebrates, such as tiny crustaceans and worms. In captivity, feed them plenty of vegetable matter, including nori or leafy green vegetables. You can feed them these foods with specially made vegetable clips, sold at saltwater fish stores. Remove any material not eaten within a day to avoid having it rot in the aquarium. Regal tangs do have a few specific health concerns. 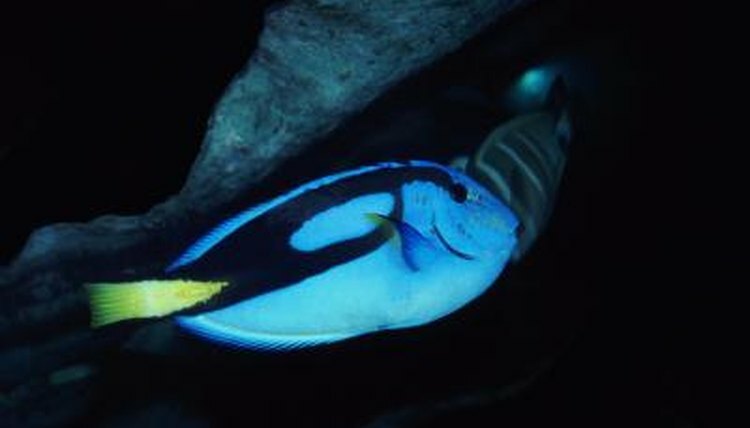 For example, regal tangs have a vulnerability to marine ich and other parasites. This typically happens when the tang is introduced to a new aquarium. Ich can cause serious problems in reef aquariums. Since the parasite has a free-living stage, you must treat the entire aquarium, and medications for ich will kill coral and other invertebrates. Additionally, regal tangs often get collected during cyanide fishing, a practice that initially stuns the fish for collection. Tangs caught this way typically die several months later, often with no warning. Only purchase these fish from trusted suppliers. Once regal tangs get established, they make hardy aquarium fish. They also work well in reef tanks, since they rarely bother coral. When young, they make model aquarium inhabitants. However, when they reach their adult size, about a foot in length, they become more aggressive. Still, regal tangs are not as aggressive as many larger surgeonfish. You can avoid aggression issues by not including other tangs or similar-looking fish in your aquarium, or adding the regal tang last.